This sweet standing open heart spray honors the dearly departed with a blush of pink roses and peonies. 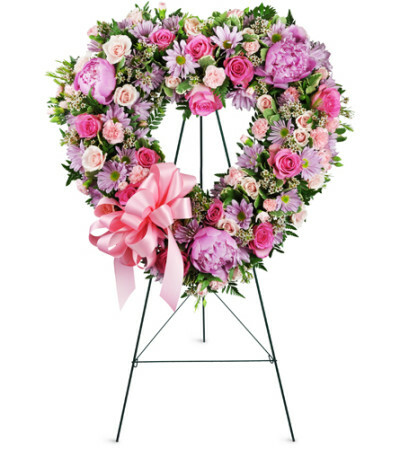 Perfect for remembering women and girls of all ages, this sympathy gift is as beautiful and unique as she was and will enhance the décor of a chapel or visitation parlor alike. Comforting and tasteful. Filled with roses, peonies, daisies, and more, all in shades of pink and lavender, this open heart standing spray is appropriate to send to the funeral home or service. Thank You. Jane loved the arrangement. 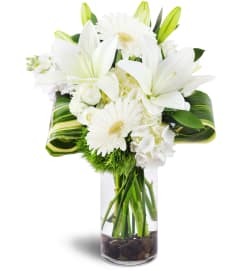 Flowers were great - the vase not so much: a cheap straight sided clear glass cylinder that is too high, leaving 3-4 inches of water below the stems. Not what is pictured! I expected better. Excellent service and flower quality. The best way to use this florist is to allow them to choose the flowers. Oaks Florist is a Lovingly Florist in Westlake Village. Buying local matters. Discover how Lovingly supports local florists. Copyrighted images herein are used with permission by Oaks Florist.